Land – its access, control and ownership – lies at the heart of power relationships within Uganda. The struggle for land is deeply intertwined with the struggle for women’s rights. Women’s access to and control over resources and economic decision making is fundamental to the achievement of their rights. Despite some progress, inequality between women and men in ownership and control of land remains stark. Women’s rights organisations (WROs) in Uganda have identified changing patterns of land use as a major problem affecting women across the country. While land has long been a locus of conflict and dissent, the most recent wave of dispute is caused by what has been termed the land rush or land grabs – investors purchasing or leasing land for mining or the production of cash crops. The economic ideology, espoused by governments throughout Africa and beyond, is that increased foreign direct investment and the commodification of agriculture will create a more developed and prosperous economy with jobs and wealth. The reality for many rural women has been very different. For the past decade, the Ugandan media has reported numerous evictions and clashes over land, fuelling community tensions across the country. Disputes around land have become common in Uganda due to the land rush displacing farmers to make space for intensive monocrops, oil exploration and infrastructure projects. Government purchases land, often providing land owners with no choice and limited compensation, and then lease it to investors, including foreign companies. A Commission of Inquiry into land matters, mandated by thegovernment, is currently under way (see Section 4) with a mission to investigate the effectiveness of law, policies and processes of land acquisition, administration, management and registration in Uganda. 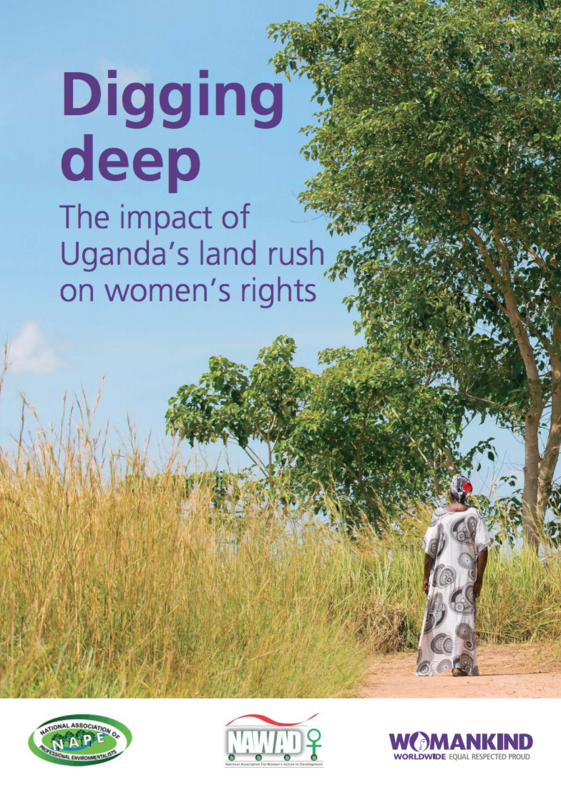 In this report, we aim to demonstrate the impact of land acquisition on women’s rights, as well as explore how the deeply entrenched unequal gender relations and discriminatory social norms – present in Uganda as in every other country in the world – result in significant gaps in Ugandan land laws (see Section 3 for a discussion on land and law). In Section 2 we share the feminist participatory action research (FPAR) methodology used in this project. Section 3 considers Uganda’s complex land laws, and the way in which discriminatory norms prevent women from obtaining justice. Section 4 highlights the impact of the land rush on women in five districts of Uganda, urging us to learn from the testimonies of the rural women most affected. To protect these women’s identities, we have used pseudonyms in lieu of their real names. Womankind Worldwide is a global women’s rights organisation working in solidarity and equal partnership with women’s rights organisations and movements to transform the lives of women. Our vision is of a just world where the rights of all women are respected, valued and realised. The National Association of Professional Environmentalists (NAPE) is an action organization committed to sustainable solutions to Uganda,s most challenging environmental and economic growth problems. We monitor government actions, conduct research, provide educational materials, develop science-based strategies, organize affected communities, make common cause with other civil society organisations and international organizations, and engage government officials at all levels.